We have LOTS of babies coming soon! We will be selling many of them and will be moving along a few does in milk and a few mature boers. Please contact us if you are looking for something specific. We will post available animals on the for sale page as well. This handsome buckling was born on March 28, 2019. He is out of 3 Kids Farm Megan and Ranchocabra Dark Moon. 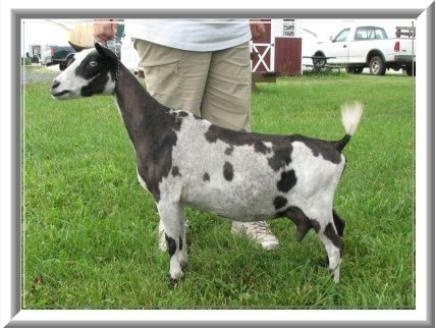 His paternal granddam, CH Tiny Town Blue Moon VEEE 90 is an ADGA Elite doe. He is a nice little genetic package and has flashy color and blue eyes if that is your thing. He can bring some nice type to your herd without breaking the bank. He sells on the bottle, has been disbudded. $400 takes him home!